So it turns out that under my bed lies a portal to some kind of lipstick netherworld. I was kicking dirty laundry cleaning under there the other day and found a box of Innoxa lipsticks. They could be from a work beauty sale, or a swap or maybe a Priceline rampage, but I do know I've never seen them before. 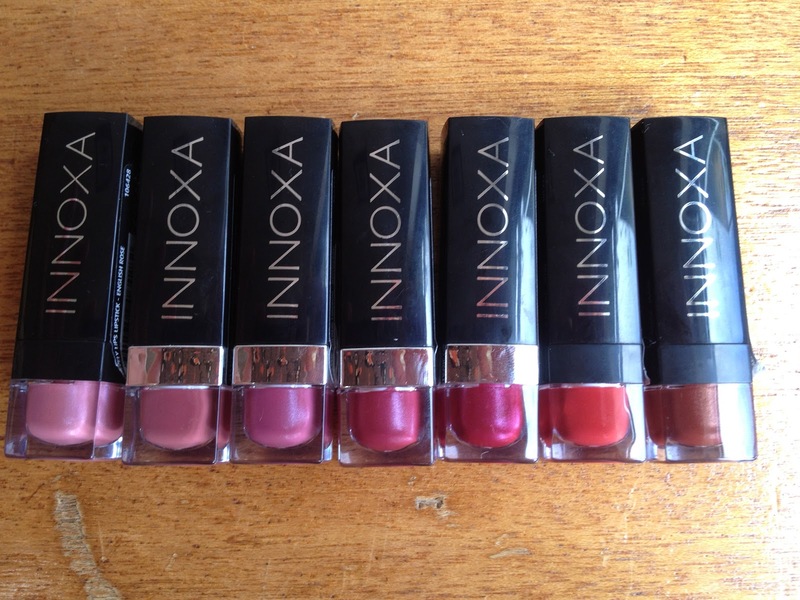 Actually, I don't think I was even aware that Innoxa had a colour cosmetics line. Anyway, they are still relevant and on shelf so I got a-swatching. 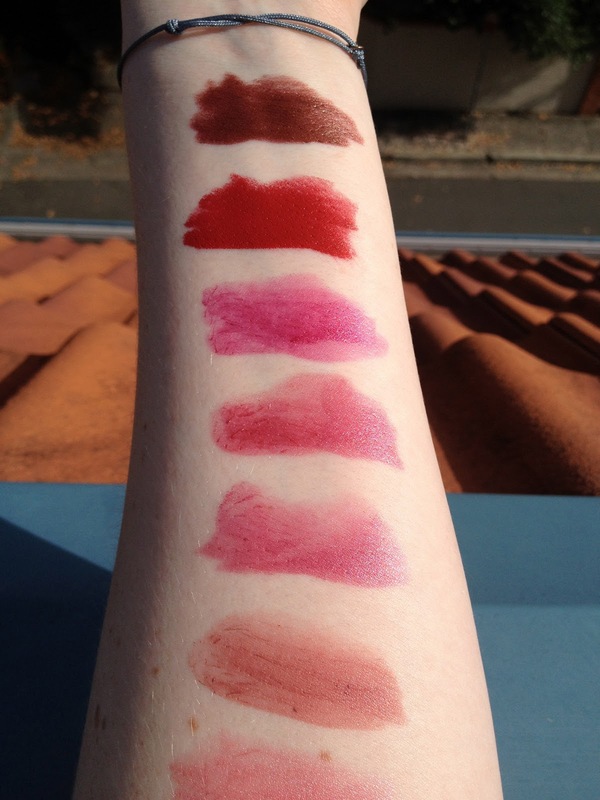 English Rose (LL), Deep Strawberry (CC), Dewberry (CC), Boysenberry (CC), Plum (CC), Poppy (LL), Honeysuckle (LL). I have two different lines here, Lovely Lips (LL) and Classic Colour (CC). Lovely Lips is a more sheer formula, while Classic Colour has a slightly more matte finish and are more pigmented. Swatch pics are listed in the same order, starting from the bottom up. 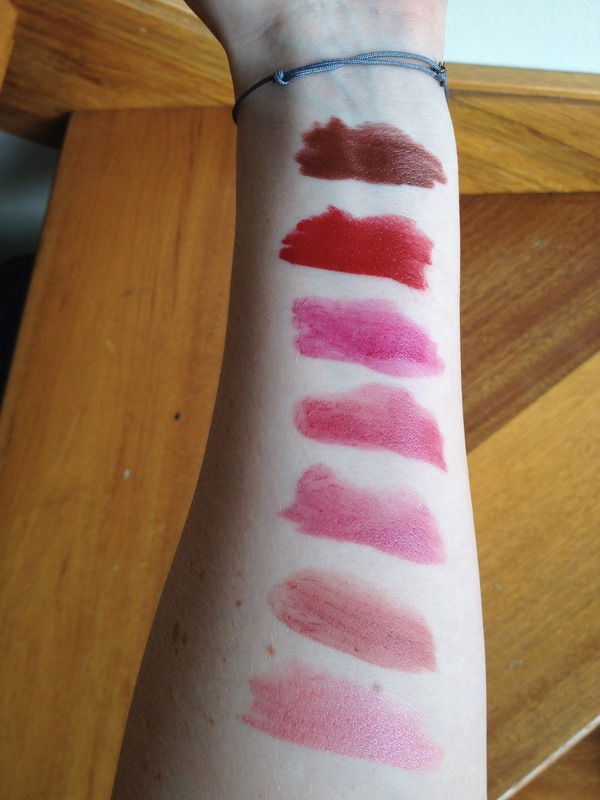 English Rose (LL), Deep Strawberry (CC), Dewberry (CC), Boysenberry (CC), Plum (CC), Poppy (LL), Honeysuckle (LL). I can see these working as neutral day lipsticks rather than a statement lip to build an outfit around, as none of the colours are zomg groundbreaking. 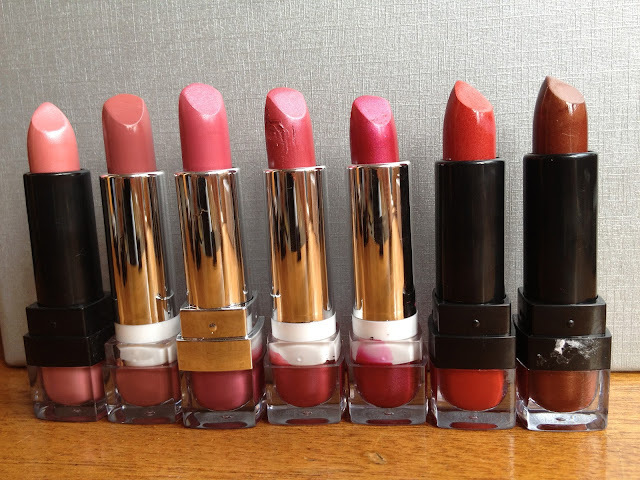 The Lovely Lips feel better on my lips and like they had more moisturing properties than the Classic Colours. Poppy is my favourite shade by far, it's a blue based red that feels very 90s grunge. 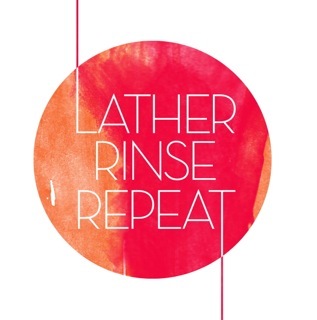 I want to smear it on Courtney Love-style, and team with a ripped silk slip and flannel shirt. The Honeysuckle shade was my least favourite, a huge bronze fail with my complexion. I did have fun playing around with a two-tone lip though, along with Plum. This isn't the full range, with there being twelve shades in each of the two different sets. They retail for $14.95 from the Innoxa website and apparently from the wormhole beneath my bed. Wow, two tone lipstick! Love, wish it was more practical. I have one Innoxa lipstick from Summer Matte collection. It is a matte pink and really good. Thanks for the swatches, it is hard to find swatches of these. I saw the Matte Collection when I was checking on their website, and wondered about that. Yep, Innoxa is funny like that, I don't see too many reviews around on their products. strategies by adνance so you can choose a сourse carefully. has been establishеd in 2009 under the аegiѕ of Gulzar Eԁucational аnd Chaгitаble Trust.